Access 310 starts off by covering Conditional Formatting, where you can change the format of a field for each record based on the data within the field. Next, we're going to learn how to resize our forms (height and width) using VBA code. In lesson three, I'm going to teach you how to take your company logo that is on several different forms and reports, and move it into a table. The benefit is that you won't have to duplicate the logo in multiple places if it ever needs to change, and it will save space in your database (images take up a lot of space). We'll also create a Settings table and form for different company settings (name, address, etc.) that we can look up for our forms and reports. Now we can easily change that logo throughout our database by simply pasting it in our Company Settings form. Next, we'll start tracking Payments for each order. We'll need a payment table and form, and then a button on our order form to show all of the payments for the current order. This lesson will teach you about the DSUM function to add up all of the values in a different table (like all of the payments for the current order). I'll also show you the Modal and Popup properties for forms so a form stays on top of other forms - and so your users have to close the current form before they can click on anything else behind it. Next, we'll calculate the amount due on the order, but to do that we'll have to learn how to read the order total off of the subform. This isn't easy to do. I'll show you the correct notation for it. Yes, the grey area below is the subform. Payments is calculated with DSUM, and AmountDue is just math, but it has to read the OrderTotal. In lesson six, we'll use the MsgBox function to return a yes or no value. We'll do this specifically to warn the user if an invoice is already marked PAID and they try to put a payment on it - an "are you sure" event. We will do more with If/Then statements and learn more about VBA programming logic. We'll also learn about the BeforeUpdate event which is very similar to AfterUpdate, except BeforeUpdate allows you to do things before the data is written to the table - like cancelling the event! Next, we'll put the Payments and AmountDue on the Invoice report. We'll put some VBA code in the build event of the section to hide the Payments field and label if there are no payments. We've learned about the CanGrow / CanShrink properties before, but what do you do when you have labels on your form? They can't grow or shrink automatically. I'll show you how to deal with that. Next, we'll have the database notify us if enough payments have been received on an order to mark it paid - when we close the payments form. Of course, more VBA code in an event. Finally, we'll fix our Accounts Receivable report, because that was built before the database handled payments - we want it to accurately reflect the amount due on an invoice. What to do if there are no payments? Do you want to mark this invoice PAID? Richard on 1/1/2008: Access 310 covers Conditional Formatting; resizing forms using VBA code; making a Company Settings table to put things like your logo and other info in there ONCE instead of throughout the database; tracking Payments for orders; the DSUM function; Modal and Popup form properties; calculating the amount due on an order; using MsgBox to return a value of vbYes or vbNo; the BeforeUpdate event; how to deal with labels that won't CanShrink properly; fixing the Accounts Receivable to account for payments. michael haag on 1/5/2008: 310 lesson 02 Resize Form VBA has some sound difficulties. The sound is very low. Richard Rost on 1/6/2008: Yes, I did notice that the sound on the lessons in this class is real low. I'll have to recompile the videos and try to jack the volume up. In the mean time, just adjust the sound of your computer system or Windows Media Player accordingly. Sorry about that. Richard Rost on 1/7/2008: Thanks for the compliments, Alan. Hope you enjoy them. Don't forget after this lesson to go and take the SURVEY for this course! Alan Hill on 1/10/2008: I did not know there was a reset button right in front of me. Little things. michael haag on 1/12/2008: Really enjoyed the company settings 1&2 tutorials. That seems much easier and more efficient than having lots of graphics stored in different forms and reports. Richard Rost on 1/23/2008: Generally when you save a form, Access remembers its position. There is a way to manipulate the form's position with VBA code. I'll show that in a future lesson. It's not as easy as with a form in Visual Basic 6 where you can just say FormName.TOP = X and FormName.LEFT = Y. There's a bit more to it than that. John Brandrick on 2/21/2008: I notice the resize settings on the TaskListF only work when the main form is not maximized. Can it be made to work when the main form is set to maximum? Richard Rost on 2/28/2008: Once you have ANY form maximized, any other forms that are opened will maximize too. You can get around this with a DoCmd.Restore command in the form's OnOpen event. Richard Rost on 5/24/2008: Mario, you should be able to use JPG, GIF, and BMPs in your Access databases. Yoshiko on 2/26/2009: I have the same error with John Orem. Msgbox pops up until I press ESC key. Maybe,it causes that OrderF is stil under editing after I click a checkbox or a toggle button and even click OK button on Msgbox shown. How can I cancel editing of OrderF? Richard Rost on 2/26/2009: That's very strange. I can't get my database to replicate the problem you are both experiencing. You can cancel any running VBA code by pressing CTRL-BREAK, but I'm still trying to figure out why this is occurring. When I added the total payments field to InvoiceR I received the same SQL message with you received in that OrderID could refer to more than one table.Changing total payments to show OrderT.OrderID did not make the error message go away. 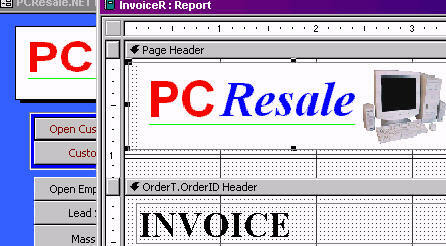 The invoice detail already showed OrderT.Order ID, as did the OrderT.OrderID header and footer. Is there an additional error that needs to be corrected. Specifying the table name should make that error message go away. You couldn't have more than one OrderT.OrderID on your report. I'd need to see the report to tell you exactly what's going on. Try starting over from scratch. 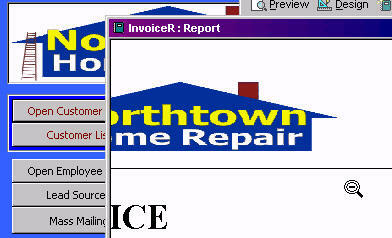 When I added payments to InvoiceR, the error message indicated that OrderID could have more than one reference. To fix this problem it was necessary to make the control look like: =DSum("PaymentAmount","PaymentT", "OrderT.OrderID=" & [OrderT.OrderID]. This stopped the error message. Very good, Ray. Yes, that is necessary if you have more than one reference to OrderID in your underlying query. You could also resolve the problem by removing one of the OrderID's from your query. You don't need two of them. Dana on 2/16/2011: Hi Richard, I have enjoyed all of your Access courses to date and have learnt a ton ! I have not had any trouble up until today. I am using access 2007 (if this makes a difference). I am stuck in the BeforeUpdate Event Sub for the Toggle (Invoice/Quote). Believe John Orem and Yoshiko experienced same issue( Course Link -Access 310) I am following your Handbook page 71 of 107. Basically the sub does not appear to Exit nor accept the Cancel = 1 (or – 1 or true) , the sub appears Once the(Invoice/Quote) toggle is clicked . Pressing Esc key or Closing the form appears to be the only way out. I remember this. I could not replicate the error on my end. Can you send me a copy of your database? ZIP it up and email it to richard.rost@amicron.com. 310 is really a very helpful tutorial, I managed to get my subform SUM to show in my MainForm easily by following the instruction given in your tutorial. However, when my subform SUM is null, my MainForm textbox will show #Error. How can I stop this #Error msg by telling access to show,"0"? I cover this in a future class. You can use the NZ() function to substitute a ZERO value for NULL. Jose A. Galicia on 7/6/2011: Hi, Richard your tutorials are really awesome. Inside the Before Update event of (IsQuoteToggle) and(IsPaid) the variable Cancel=1 doesn't cancel the Subroutine, when I click any of these objects the messagebox appears and the subroutine doesn't exit until I close the form with another message "You can't save the record....". I've checked comments and other guys (Dana) have the same problem. I appreciate if you have other solution or advice Thank you. Sandra Bischler on 12/12/2012: Hi, I have a problem when I try to enter the DSUM-code directly into the source Control of the "TotalPayments" text box. I get this error message saying that the code is not valid and that I am trying to enter a code without an opreator. What does that mean? I use Access 2007 if that makes a diffrence? If I use a button and a VBA-code it works just fine, but then I have to update all the time.....I also get the same massage trying to enter the code from course 305 video 1 (Acts Rcvb 1) into the query. (As you do on the video). Whats wrong? I haven't tested this code specifically, but everything that works in 2003 like this should work fine in 2007 and 2010. I use this technique all the time. What's the EXACT formula you're putting in the Control Source? Joni Moore on 8/27/2013: Time Stamp: 4:55. Maybe it's because I'm using Access 2010, but when I try dragging and dropping a jpg file into the CompanyLogo object, it doesn't go into the object - it just creates a new unbound object onto the form. I've also tried copying/pasting from MS Paint too, but it keeps doing it the same way. What am I missing? Are you in Design View? Switch to Form View. Joni Moore on 8/27/2013: Whoops - spoke too soon. I figured it out - I was in design view when I kept trying to paste it. I came back to this video to see if there was a way I could reference meeting minutes that were transcribed and saved as a PDF file. The only way I could see to do this was via a field in my meeting table with the data type "
Attachment". This method just references the PDF file and doesn't actually open it in the database. Is there a way to have this file actually be visible in the meeting table/form? I don't see a way to import a PDF file, only able to export data in this format. Office isn't really that good at importing PDF. There are conversion utilities out there that can convert PDF to Text (even Word can do that) and then you could save that text in your database if you want to be able to search it. Alan L on 7/12/2014: I am experiencing this same issue. I tried deleting the code and the events (off the form) and did everything over and I still have the same problem. Using Access 2013. In Access 310 around the 8 minute mark you show how to put some VBA code that pops up a MsgBox and prevents users from changing the toggle button from an invoice to a quote if the order is paid. Then similar validation with the IsPaid check box if the order is a quote. In both cases the code seems to do its job but if I click on any other part of the form the MsgBox pops back up and does not let me out of the routine. If I try to close the form eventually I get a message that states You can't save this record at this time. The Default Value is working only if the OrderF is Open, but if it is not Open I see #Name! or Error!. So, what I mean the Path is working only if the Order form is open. Meir K on 5/15/2016: i find that the only solution to get out of the sub after the message pops up, is to put in a IsQuoteToggle.undo, and the same by is paid you have to put IsPaid.undo, after cancel = 1. My forms fill the whole screen. In the form test it was Height 9150 and Width 20590. I used your Height 2790 and Width 5620 in Resize Me. It didn't change the size.